Our 10 ½" x 10 ½" all-cotton white, "Hearts and Bows" handkerchief has been very popular. Featuring four corners with white bows and eight tiny red hearts tied to the bow strings, this fully-scalloped edge handkerchief is a really sweet creation! Great buy! 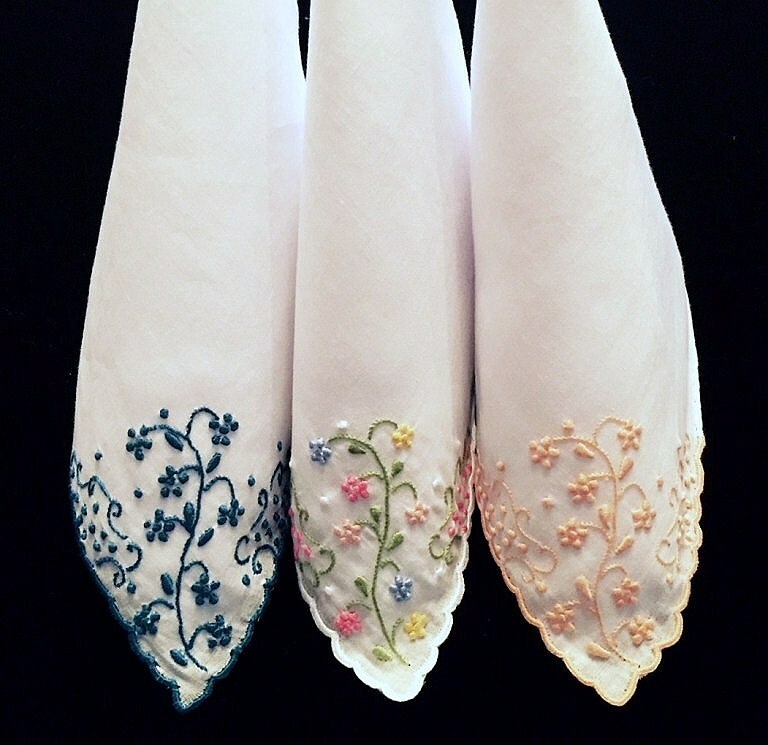 This trio of hand embroidered cotton handkerchiefs is a spectacular offering! Made in Madeira, Portugal, each handkerchief features exquisite colored embroidery with a scalloped corner and hand rolled hem. Available in three stunning color ways: (A) Teal. (B) Multi-colored, and (C) Tangerine at an unbelievable price! Very limited quantity. As a special gift from you, or for you, this 14 inch square hand embroidered handkerchief is stunning The single corner embroidery is exceptional in design and workmanship featuring raised petite flowers, traditional Madeira open work, and multi colored threads framed in a raised scalloped border. A little gem sure to please. Designed, hand embroidered and hand rolled in Madeira, Portugal. 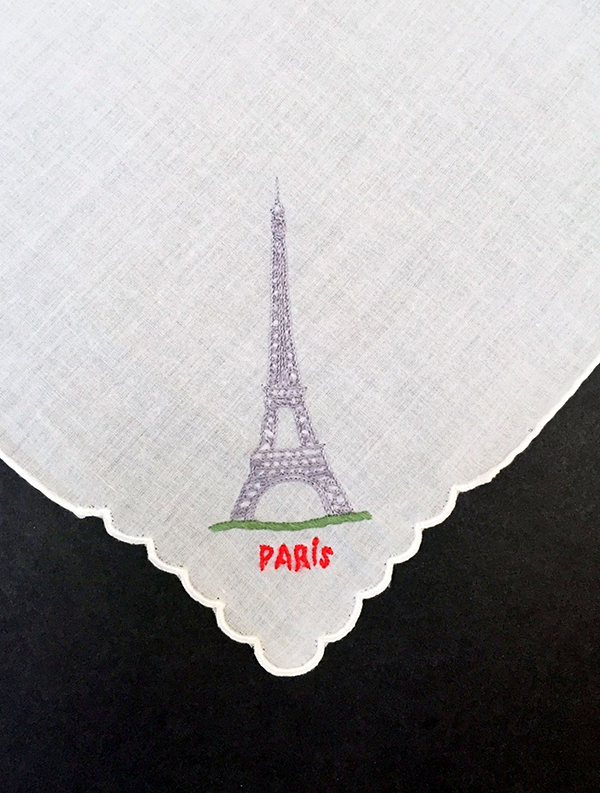 “We’ll always have Paris” said Bogie to Bergman in the classic film Casablanca --and so will you and your friends with this beautifully hand-embroidered handkerchief featuring the iconic Eifel Tower. Measuring 14” square, this all-cotton hanky was fashioned and hand rolled in Portugal! You asked for it and we heard you. This smart up-to-the-minute classic black and white cotton embroidered handkerchief is a must accessory tucked in your cross body bag to complete your fashion statement. Distinctively understated, the soft black cotton has a single white floral embroidered corner, and a white embroidered scalloped border, a perfect accent. Don’t wait, limited quantity. Reflecting Keats' A thing of beauty is a joy forever," Rose Beauty is an exquisite all cotton handkerchief blending Madeira artistry in design and superb embroidery. Measuring 13 ½"x 13 ½", the combined colorful appliqué and hand embroidery rests on a solid black background with a hand rolled edge. Perfect for rose lovers or saying "I love you." A Swiss 11 ½” x 11 1/2” Swiss cotton handkerchief is perfectly embroidered with six raised white eyelet roses accenting a single corner. The entire handkerchief has a scalloped edge. A rose for any occasion! 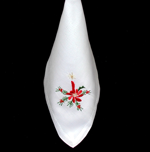 A fine soft Swiss 11” x 11” cotton handkerchief beautifully embroidered with double rows of Lily of the Valley buds. This little treasure, embellished with pearlized threads, is finished off with an extraordinary scalloped border. The detail is amazing! Perfect for a bride or bridesmaids or for any lover of Lilies of the Valley. The familiar holiday candy cane highlights this striking hanky measuring 10 ½" x 10 ½ ". The bright red and white cane is embellished with a sprig of holly and a stunning gold metallic bow. A great stocking stuffer or party favor at a remarkable price! Candlelight brightens our all cotton handkerchief with berried boughs and a bright red poinsettia. This "tis the season" 12 ½" x 12 ½" hankie boasts a lovely hand hem-stitched border with a hand embroidery design from Portugal. Bring on the reindeer! You will love our beautiful holiday cotton embroideries featuring Angels, Boughs of Holly and Jolly Old St. Nick himself. All three patterns are well-priced, measure 13" x 13" and promise to evoke special thoughts of the season. Order early as supplies are limited. Measuring 13 1/2" X 13 1/2" this lovely cotton handkerchief features an embroidered bouquet of purple violets wrapped in a silky ribbon of white. The finishing touch is a 1 1/2 " border of woven stripes framing the picture perfect pretty purple violets and a hand rolled hem. A best buy! An elegant four-corner Chinese cotton embroidered - handkerchief richly decorated in one corner with a ribbon bouquet of flowers. White, only, this beautiful handkerchief measures 13" x 13". 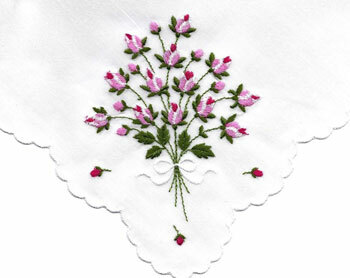 This striking 11 ½" x 11 ½" handkerchief is a beautiful example of hand embroidery. The white cotton background features colorful yellow, pink, and red roses in raised embroidery accented by a field of blue background flowers. Each corner contains a nosegay of all three rose colors. Lovely! One of our top-selling handkerchiefs, this chief value linen beauty is an absolute best buy! Just picture a field of white linen dotted in all four corners with hand-embroidered flowers of blues, purples, pinks, whites, and reds. Each flower is encased in its own hem-stitched border, accenting both design and classic appeal. Measuring 11" x 11" this little gem seems so much bigger with those forty flowers, a perfect bouquet for birthday, anniversary, or any other special occasion! 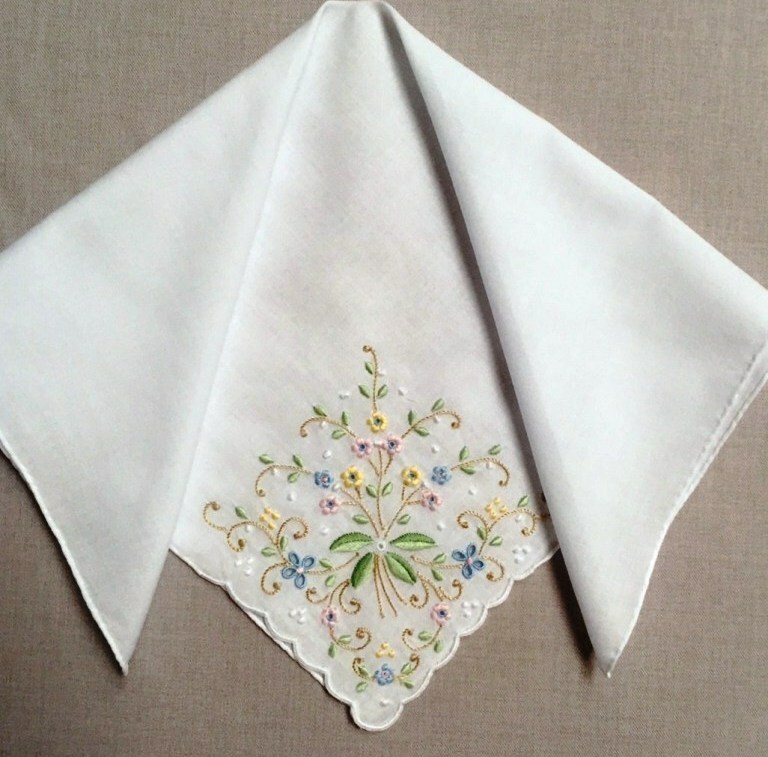 Beautifully executed, this 14" x 14" all-cotton white lady's embroidered handkerchief is a gem. Made in Portugal, the leaf and floral shadow-embroidered technique includes traditional open-work and thirteen exquisitely sewn petite flowers. A companion to 1603R, our Bouquet of Daisies features a corner bouquet of nineteen white and yellow daisies tied with a yellow ribbon an all white cotton background. 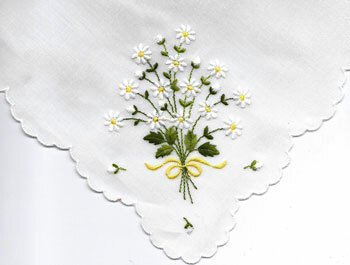 Pairs of daisies accent each of the remaining corners of this also beautifully scalloped 11 ½" X 11 ½" handkerchief. Sweet! Sure to please, our Swiss "Bouquet of Roses" features a corner bouquet of nineteen pink/white and red roses tied with a white bow on an all-white cotton background. Pairs of roses accent each of the remaining corners of this beautifully scalloped 11 ½" X 11 ½" handkerchief . Lovely! Top of the mornin' to you! Our latest Irish all-linen handkerchief measures 12"x 12" and features 36 hand embroidered shamrocks wishing you all the luck in the world! Made in Portugal, this beautiful lucky charm is complete with a ½" hem-stitched border. Everyday is St. Valentine's Day with this beautiful all white linen 12" x 12" handkerchief dotted with 36 hand embroidered hearts. Made in Portugal, this very special handkerchief also features a 1⁄2" hemstitched border. Beautiful for pocket, purse, jeans or dress! Hand-made in Madeira Island, Portugal, this 11" x 11" tone-on-tone pastel cotton and hand-appliqued handkerchief features a beautiful raised embroidered butterfly in one of three colors. Each handkerchief contains a solid tape border of the primary color with an accent white stripe and hand-rolled edge matching the color of the handkerchief. Pick your favorite suit, ladies: Diamonds, Clubs, Hearts or Spades. Sure to impress your card-playing friends, this superbly hand-appliqued, 14" x 14" Swiss cotton "four suits" handkerchief is made in Portugal – bound to bring you luck! Our customers just can't resist our HOT LIPS handkerchief, a Swiss all-cotton black handkerchief with six hand-appliqued red hot lips! Tasteful in design and a real conversation piece, this Madeira-made hanky is elegant, fun, and fashionable! The beauty of this 12" square Swiss embroidery is breath-taking! It features a beautifully scalloped border accented with 20 perfectly matched butterflies created through raised embroidery and white stitching. The inner face of the handkerchief, just beyond the butterflies, further enhances the beauty of this Swiss treasure through 36 tiny embroidered hearts linked together. Elegant in design, this beautiful creation is perfect for any collector of fine accessories. Made in Portugal, this exquisite 14" x 14" all-linen white handkerchief features raised embroidery in all four-corners with a single scalloped corner centerpiece accented with hand appliqué and floral leaf embroidery. Stunning! Direct from Madeira, Portugal, this lovely 12" X 12" all-white linen handkerchief is a great buy with its four corner embroidery and cut work. A single magnified 2" X 3" corner is embellished with raised embroidery and traditional cut work. Hand rolling compliments the overall impact of this reasonably priced linen beauty. single corner comprised of raised floral and shadow embroidery motifs with a hand scalloped edge and a hand rolled finished hem. Simply elegant for a mother of the bride or anyone who appreciates quality European craft! Made in Portugal, this Swiss cotton, hand-embroidered, double-layered appliqué organdy handkerchief is absolutely breath-taking. The exotic single-corner, large red water lily is complemented by raised red and white embroidery on three corners. 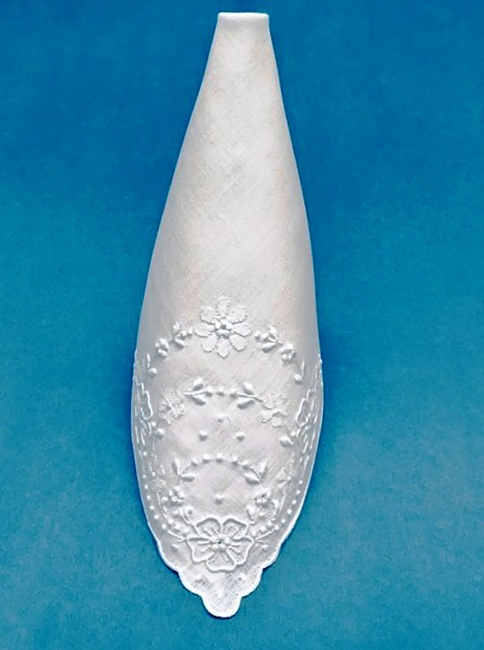 A ¾" white tape border and a three dimensional effect created by a central organdy floral petal that lifts up complete this extraordinary 14" x 14" hand-rolled handkerchief. 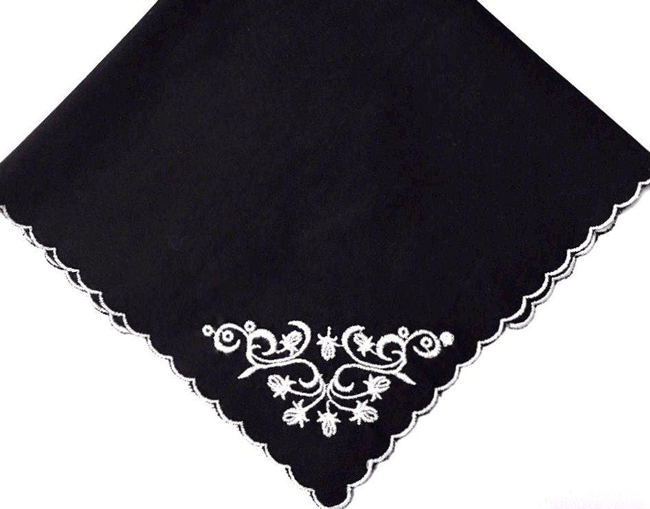 For the handkerchief connoisseur, this all-linen 12" x 12" exquisite handkerchief contains single-corner raised embroidery with a scalloped hand-rolled edge. Made in Portugal, this little treasure comes in WHITE, only. This beautiful Swiss hand-loomed and embroidered Pocketful of Pansies handkerchief is simply stunning! 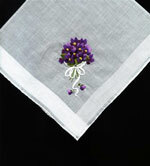 A 1" border of multi-colored flowers decorates the entire perimeter of the 12" x 12" white chief value linen background. Purples, yellows and lavenders with tinges of white and fuschia are all abloom, and a delicate scalloped border surrounds the field of pansies. Gorgeous! If you love spring and the scent of Lilies of the Valley, this superbly crafted handkerchief is for you. 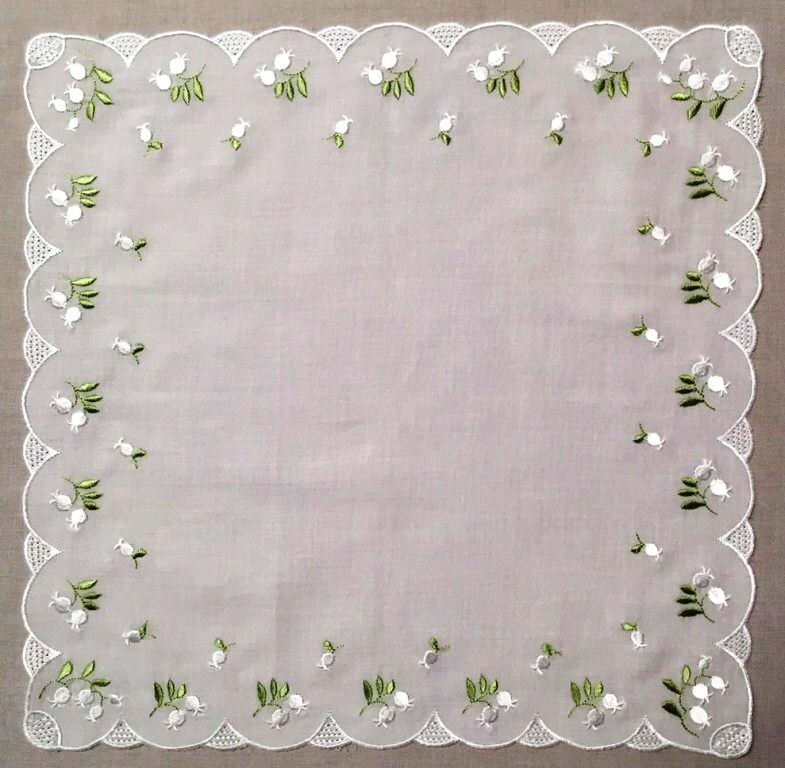 Made in Switzerland on white chief value linen, this 11" x 11" exquisite handkerchief features 36 clusters of hand-loomed Lilies of the Valley enveloping the entire border of the handkerchief which is finished off with a simple hand-scalloped edge. Irresistible! Superior quality! All pictures contained in this site property of Giovanni's Handkerchiefs. All copy is sole property of Giovanni's Handkerchiefs.